I recently posted a recipe for delicious and healthy vanilla matcha latte popsicles using Zip Pops. 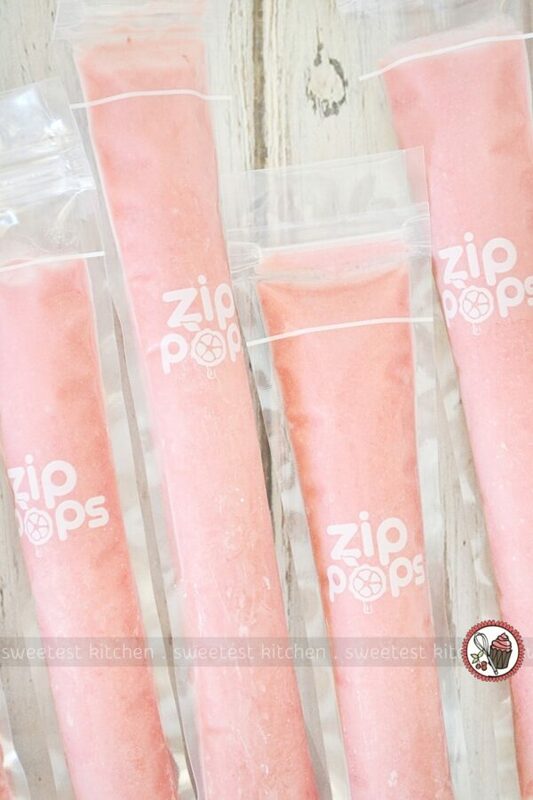 But what exactly are Zip Pops? 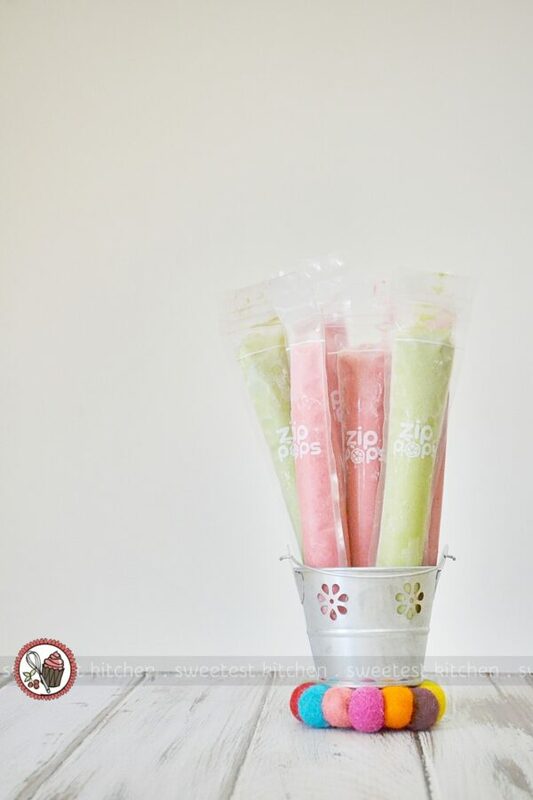 Zip Pops is an Australian family business, focused on providing an alternative to those brightly-colored store-bought ice blocks, which are full of preservatives, additives and stabilizers. 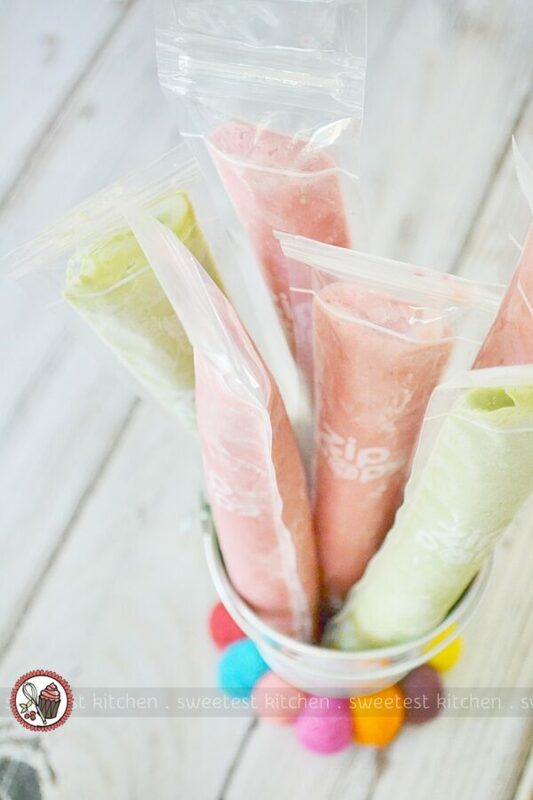 These BPA-free popsicle molds are perfect to make your own delicious ice blocks at home, ensuring that you have fresh, natural and healthy treats to offer your family. I’ve already made dozens of different flavors (strawberry & coconut, coconut & lime, peanut butter, pumpkin pie, just to name a few! 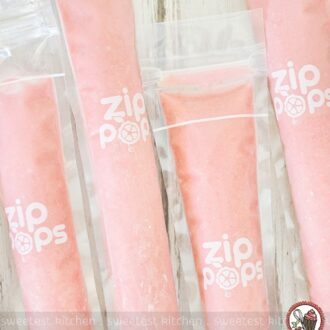 ), but these strawberry & banana pops are my daughter’s absolute favorite and are a staple in our freezer. These pops are made with loads of fresh strawberries, a ripe banana, milk, a touch of maple syrup and a dash of vanilla extract. My daughter enjoys these popsicles from breakfast through to dessert; they are an anytime treat. We don’t have any dairy allergies in our house, so we usually use a half/half mixture of whole milk and thickened cream. If you’re looking for a dairy-free alternative, you can most definitely use almond milk or coconut milk (or any other milk you prefer) in place of the cow’s milk in this recipe. 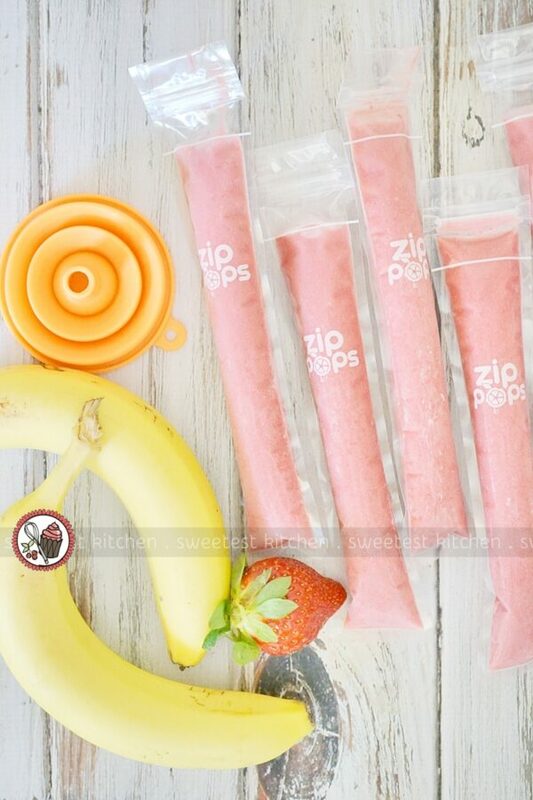 Now, here’s the recipe for these gorgeously pink strawberry & banana pops! Also pictured above, my vanilla matcha latte popsicles (recipe here). 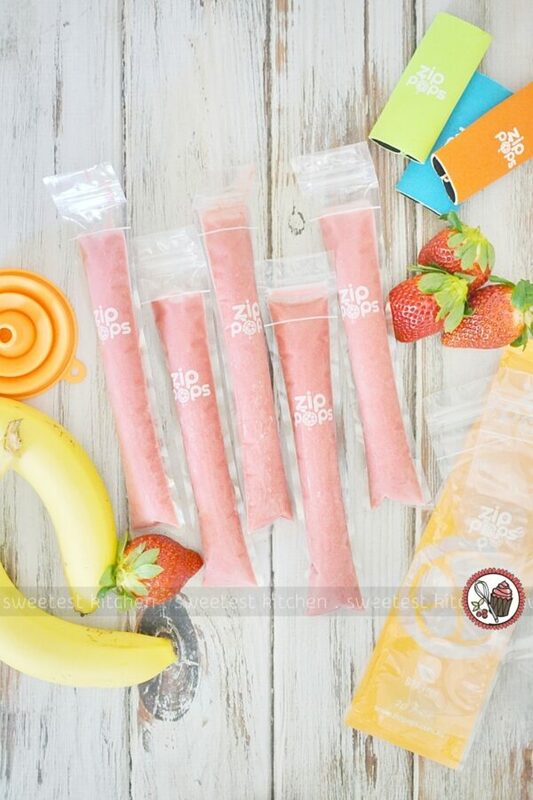 Made with fresh strawberries and bananas, these super easy homemade popsicles make a healthy treat for any time of the day! Place all ingredients into a blender or food processor and puree until smooth. Strain the mixture through a sieve, if desired, to remove strawberry seeds. 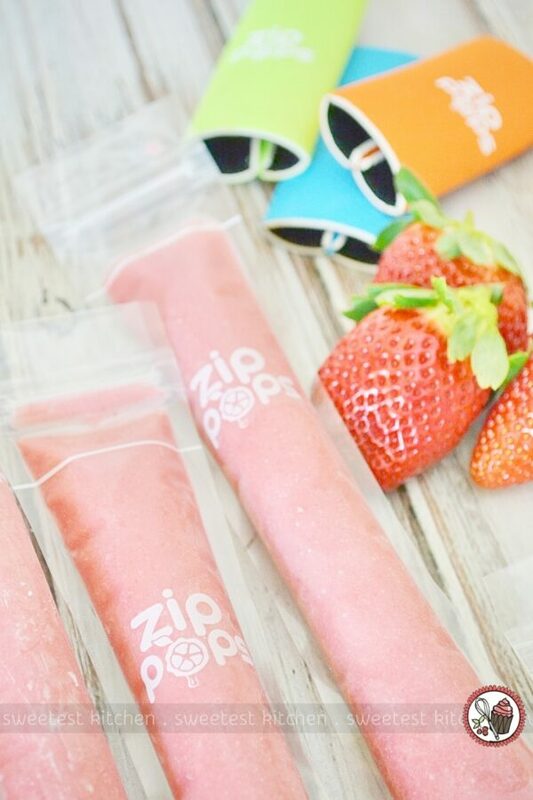 Using a funnel, pour mixture into Zip Pops moulds up to the fill line, seal and freeze in an upright position for 4-5 hours, or until frozen through. 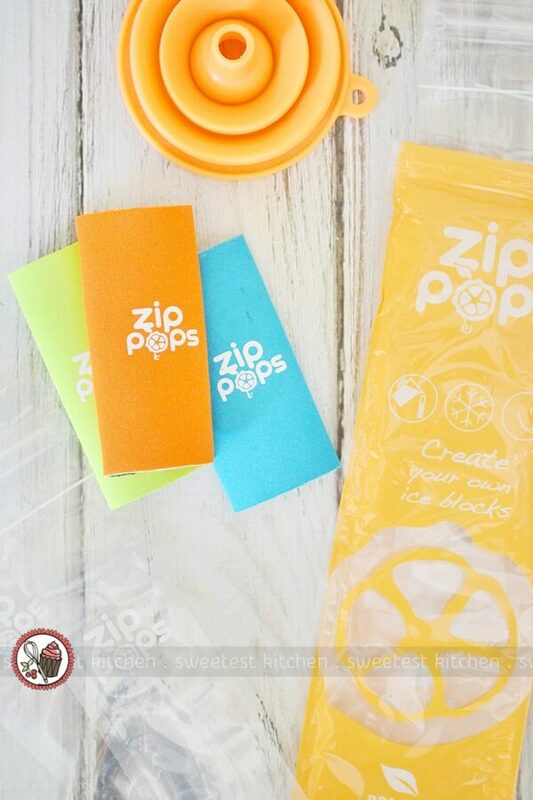 Once frozen, you can store the Zip Pops flat. 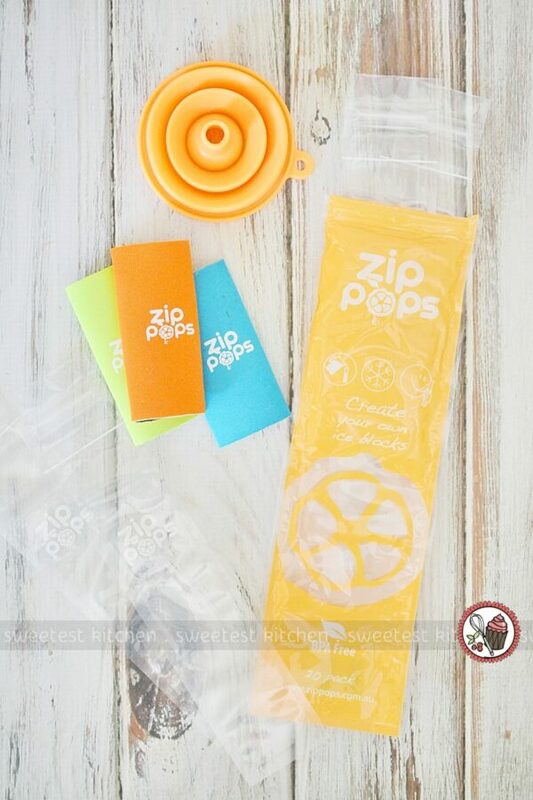 To open Zip Pops, open the seal, or use scissors to cut just above the fill line. Push the pop up from the bottom and enjoy. We use a half-half mixture of whole cow's milk and thickened cream, which gives the popsicles a nice creamy texture. However, you can use any milk in this recipe, such as coconut milk, or any nut milk. Keep in mind, the texture may be more icy when using nut milks. With different milks, you may need more maple syrup, so taste the mixture before freezing and adjust as desired. So, are these re-usable? They look similar (in the photos anyway) to snap lock bags but I assume that they can be re-used, If so, how do you generally go about washing them? Hi Sarah, yes, they are reusable. You can rinse them with soap and water as with anything else, and using one of those thin bristly brushes would be very helpful to clean down inside. Drying them is the hardest part as it’s nearly impossible to prop them open to dry completely inside. I mainly reuse them if I know I will be using them again straight after rinsing, so I won’t have to worry about them drying at all (I just give them a good shake to get excess water out). I would try heaps of flavours. My lil man only gets his fruit in his smoothies. He doesn’t eat it on its own, unless its watermelon lol. 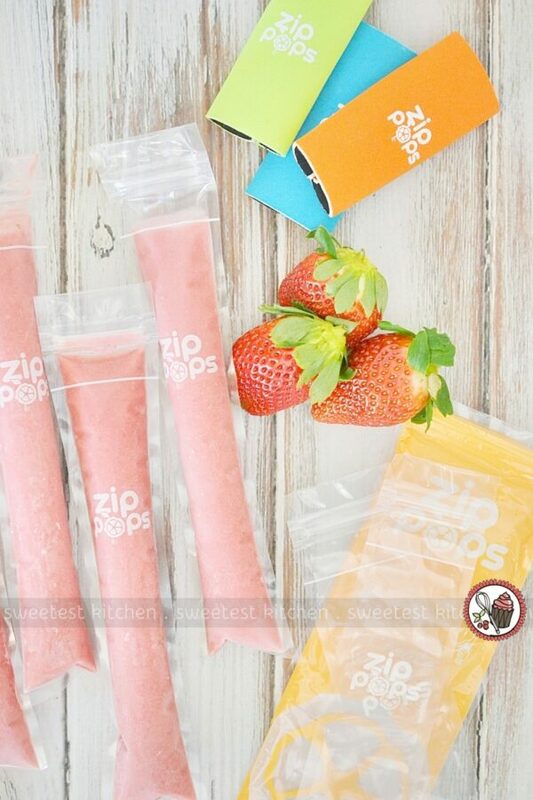 Zip pops would be a fun way to introduce more fruits into my sons diet. A trillion times healthier then zooper doopers!! There’s nothing I love more than a piña colada, pool side on a hot day! Takes me back to tropical holidays. I’d love to have these while hanging by the pool! I’m making these, for sure! Why should kids get all the fun?! I saw your recipe for vanilla matcha latte popsicles and think these would be a sweet treat for mummy to enjoy when summer rolls around! My favourite would be banana, yogurt, orange, vanilla and honey with a little milk. I’m thinking mango, coconut and strawberry. I’d definitely be making Ribena and passionfruit zip pops. I know they aren’t that healthy, but they’d be delicious! I’d also like to make cherry ones, nectarine, pretty much all the stone fruit!